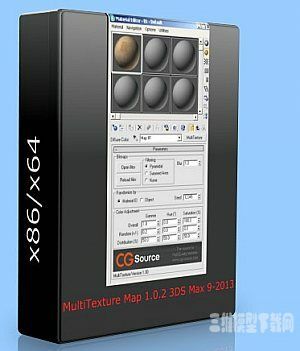 MultiTexture Map is a plugin for 3dsmax that loads multiple textures and assigns them randomly, either by object or by material ID. With controls to randomly adjust the gamma, hue and saturation. It works with 32bit and 64bit versions of 3ds Max from Max9 and all they way up to max2013. It's compatible with scanline, Vray, Brazil and FinalRender. MentalRay is currently not supported. Copyright 2010-2011 3d模型下载网 备案号:蜀ICP备09027412号-3 Inc. All rights reserved.